I was never a huge fan of history class. It wasn’t until after college that I really began to enjoy history, and then it was mostly in the form of alternate history novels. This reading motivated me to begin reading more widely in real-world history, too, though I still like the alternative stuff a little better. In 2005, I pulled some of this reading together into an essay for The Internet Review of Science Fiction on “fantastic adventure history“, stories blend alternate history with fantasy. Definitely the most potent type of alternate history in publishing these days – with or without fantasy elements included – is the sub-genre known as steampunk. This alternate history is set in an Industrial Revolution or Victorian-era setting, but the steampowered technology is ramped up a bit beyond what was realistic for the time. The look and feel of steampunk is so enticing that even Disney has gotten into it, releasing a limited edition pin set, The Mechanical Kingdom, that features the classic Disney characters in steampunk variants. Without really seeking them out, these steampunk games seem to keep coming across my path … probably because there are just so darn many of them. 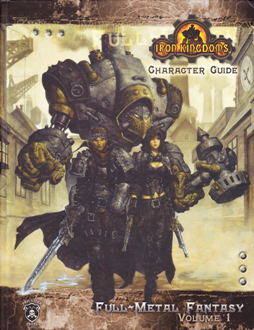 In Black Gate 15, I reviewed the Victoriana roleplaying game (available on PDF at DriveThruRPG), which also has strong fantasy steampunk themes. In that same issue, I reviewed the steampunk zombie novel Boneshaker (Amazon, B&N). Today, steampunk seems to permeate through all sub-categories of genre fiction. It also seems to permeate my house. I’ve got several steampunk novels, collections, games, and other oddities that I have had every intention of getting around to reading and reviewing. So, in an attempt to clear through this pile of steampunk populating my bookshelves, I’ve decided to begin a series of posts on recent steampunk goodies, starting with an upcoming steampunk board game: Kings of Air and Steam. Steampunk certainly doesn’t need magic, and many games adopt the steampunk aesthetic without throwing magic – or even much fantastic science – into the mix. One such project is the board game Kings of Air and Steam. This is a new steampunk-style game that I learned about the game when it was reviewed over at Wired‘s popular GeekDad blog. It’s currently in production by Tasty Minstrel Games and is being funded through a Kickstarter project. For those who haven’t yet experienced the fun of Kickstarter, it’s part of a new way of getting investment capital through “crowdfunding” a project. Tasty Minstrel Games has done this once before with their deck-building science fiction strategy game, Eminent Domain. Tasty Minstrel was nice enough to send me a promo version of the game, and I’ve got to say that even given the crude nature of the early promo – which, obviously, lacks any finalized artwork – I think that this game will hold a lot of appeal. It’s fast-paced, and there’s a rich backstory that’s been built around the steampunk setting (described on the Kickstarter page). The game was fully funded in a very short time frame, but there are several “overfunding” levels that will allow the developers to add even more complexity, including some great molded plastic miniatures. The board is modular, coming in large hexagonal pieces that are made up of smaller hexagonal spaces. In addition to being able to lay the game out differently each time you play, this means that the board itself gets larger or smaller depending on the number of people playing, to help keep the game scaled. The game also involves some nice strategy elements, as each player has to plan their route out ahead of time in secret by placing movement cards. Each round consists of players revealing their movement cards in sequence, then making the movement and performing an action (which consists of either upgrading ships or trains, building train depots, shipping goods by train, or performing a course correction). Though the movement must be determined ahead of time, you still get a lot of flexibility throughout play on how to proceed, based on events in the game ruining the objective that you had planned for that round. The demand for various types of goods shifts throughout the game, with a very clear mechanic in place for the market transitions. At one point when I played the game, there was a single factory that ended up with a large stockpile of crates which were much more valuable than the crates at other factories. Both players set their course for the same factory. One of the players arrived a turn too late, finding that all of the crates had already been snatched up by the other airship! The demo version that I played was a basic game, where the different teams really didn’t have much variability. The final release of the game will have unique characters with special abilities (as shown to the right), which lends a unique flavor of play each time you play the game. The Kickstarter project is currently near the $25,000 level, at which point a seventh team (and two new characters) will be added to the game. They’re generically calling this new team “the Mafia guys,” which seems like it’ll be fun. The Kickstarter ends on Dec. 14, so I definitely think there’s plenty of time to meet that overfunding goal. The game runs six rounds (each round made up of four move & act turns per player) and then it’s over, meaning that once you’ve caught on to the style of play, it’ll go relatively quickly. There may be some patience needed with younger (or slower) players, while you wait for them to work out their movement strategy, but that’s really the case with any board game. Check the game out and, if it looks like fun, go ahead and order your copy (or copies) now, to help improve the final product! Game stores can also get involved by signing up now for a Preview Night special discount.